Just when you think you really know the ins and outs of SDL Tridion, surprise, here’s a neat trick from Kelly Thompson, 10 year+ Tridionaut and now Global Education Manager with SDL Web Content Management solutions. Update (15-May 2012): This technique will push parent items through your child publication’s publication target. See Bart’s comment on how to prevent the extra items from being sent through (thanks, Bart!). From a child publication’s publication target, set the parent publication as an allowed publication. Now you can publish from a parent item even if its publication doesn’t have its own dedicated publication target. 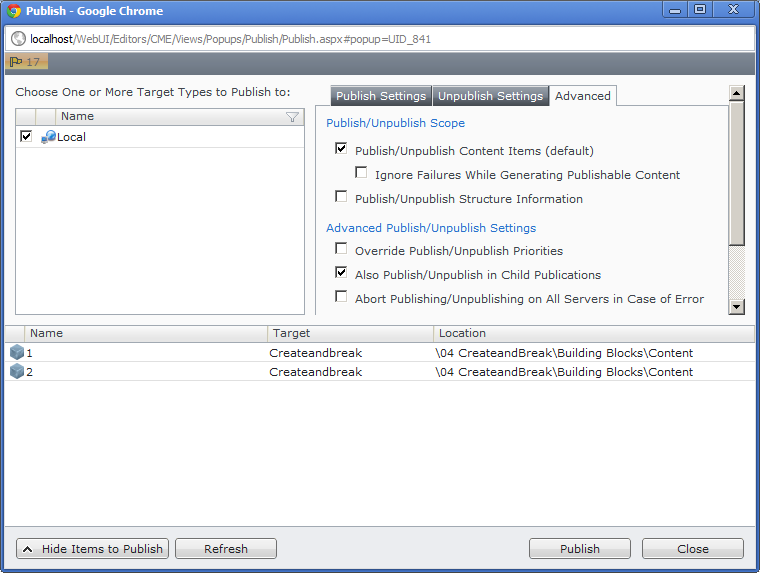 Select the advanced publishing option to also publish in child publications. Selecting “Show Items to Publish” will show what’s queued for corresponding child publications. 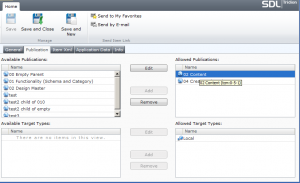 Use target types, groups, and group scope to fine tune this to your needs. Thank Kelly for the insight. Very good insight Alvin, the only thing I never liked about this is that the items for the parent publication are still rendered and send through to the Content Delivery side (where they are not needed, as we only need the child’s items). Luckily there is a solution to that using ta custom Resolver, which you can use to strip out the parent items form the publish transaction so that they will never be rendered or deployed (or even appear as published for that matter). 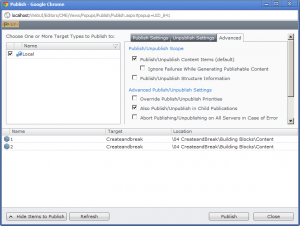 /// For publish and unpublish, remove all items from the parent publication from the list. Thanks for the catch, Bart. I updated the post with the caveat and mentioned the resolver. This setup can still be useful in scenarios where you have control over the CMS settings and code, but not infrastructure. Setting up a publication target involves configuring servers, which you may not always have access to. I totally agree Alvin, this is a very useful approach and I would actually recommend it over others. Even without the resolver it is still a good solution (I just think it becomes an even better one with the resolver ;o). How does this “hack” work when your SDL Tridion license limits the number of Publishable publications (number of publications from where you are entitled to publish)? I understand the publishing publication restriction is just on which publications represent “real” sites. The parent publication doesn’t have a site, so it should technically be okay. When in doubt check with Support and maybe your sales contact. After some testing, there is always a Warning in the event log with the Event System only approach. If this is not acceptable in your environment, you will need a resolver + event system solution to have a ‘clean queue’ result. You can use the resolver here: https://gist.github.com/willprice76/9664092 and the above linked event system, but you will need to add a check that the transaction status is success before deleting (otherwise the publisher will still be busy with it and give the warning).